Proneural genes encode basic helix–loop–helix transcription factors that specify distinct neuronal identities in different regions of the nervous system. 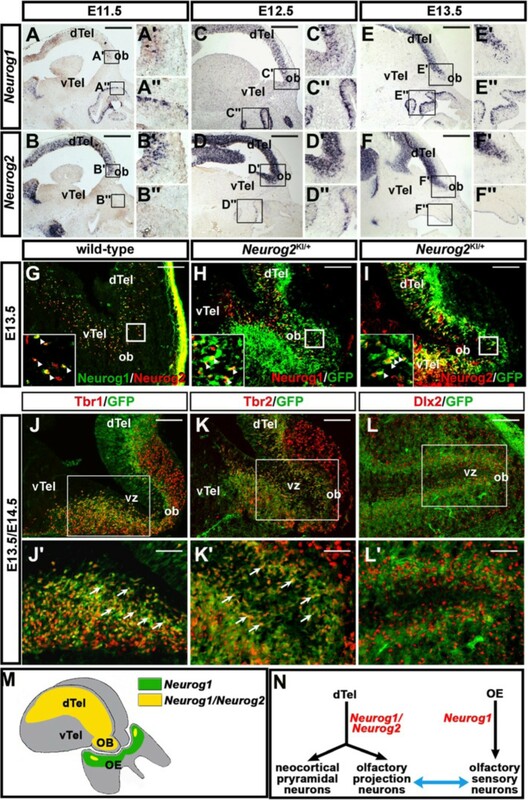 In the embryonic telencephalon, the proneural genes Neurog1 and Neurog2 specify a dorsal regional identity and glutamatergic projection neuron phenotype in the presumptive neocortex, but their roles in cell fate specification in the olfactory bulb, which is also partly derived from dorsal telencephalic progenitors, have yet to be assessed. Given that olfactory bulb development is guided by interactions with the olfactory epithelium in the periphery, where proneural genes are also expressed, we investigated the roles of Neurog1 and Neurog2 in the coordinated development of these two olfactory structures. 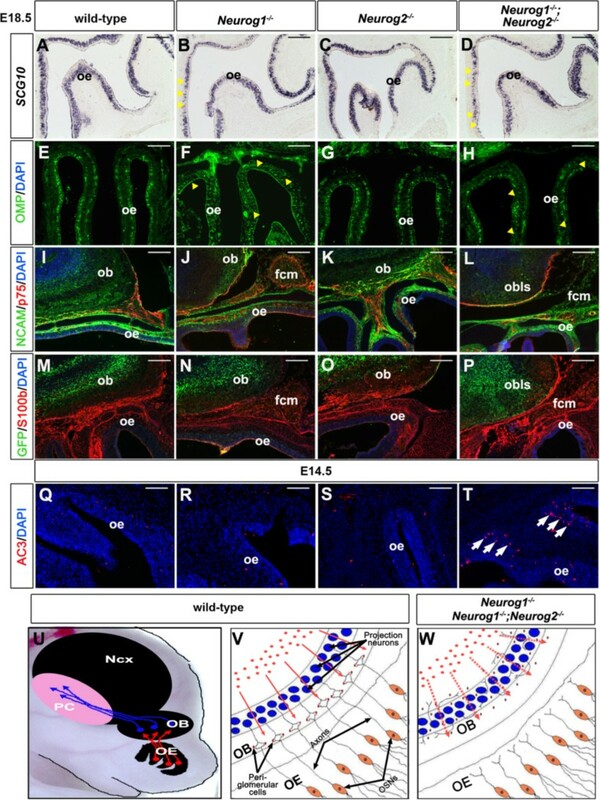 Neurog1/2 are co-expressed in olfactory bulb progenitors, while only Neurog1 is widely expressed in progenitors for olfactory sensory neurons in the olfactory epithelium. Strikingly, only a remnant of an olfactory bulb forms in Neurog1−/−;Neurog2−/− double mutants, while this structure is smaller but distinguishable in Neurog1−/− single mutants and morphologically normal in Neurog2 −/− single mutants. At the cellular level, fewer glutamatergic mitral and juxtaglomerular cells differentiate in Neurog1−/−;Neurog2−/− double-mutant olfactory bulbs. Instead, ectopic olfactory bulb interneurons are derived from dorsal telencephalic lineages in Neurog1−/−;Neurog2−/− double mutants and to a lesser extent in Neurog2 −/− single mutants. Conversely, cell fate specification is normal in Neurog1 −/− olfactory bulbs, but aberrant patterns of cell proliferation and neuronal migration are observed in Neurog1 −/− single and Neurog1−/−;Neurog2−/− double mutants, probably contributing to their altered morphologies. Finally, in Neurog1 −/− and Neurog1−/−;Neurog2−/− embryos, olfactory sensory neurons in the epithelium, which normally project to the olfactory bulb to guide its morphogenesis, fail to innervate the olfactory bulb. We have identified a cell autonomous role for Neurog1/ 2 in specifying the glutamatergic identity of olfactory bulb neurons. Furthermore, Neurog1 (and not Neurog2) is required to guide olfactory sensory neuron innervation of the olfactory bulb, the loss of which results in defects in olfactory bulb proliferation and tissue morphogenesis. We thus conclude that Neurog1/2 together coordinate development of the olfactory system, which depends on tissue interactions between the olfactory bulb and epithelium. The olfactory system is the part of the central nervous system that is responsible for detecting and processing odors. In vertebrates, the olfactory system consists of three major components: the olfactory epithelium (OE), the olfactory bulb (OB), and the olfactory cortex. Odor molecules are initially detected by olfactory sensory neurons (OSNs) in the OE, which project their axons to the OB, where odor signals are refined and enhanced before being relayed to the piriform/olfactory cortex, where signal processing and odor perception occurs. The OB is a ventroanterior protrusion of the cerebrum that serves as an intermediate processing center for olfactory signals. It is comprised of projection neurons and interneurons, each with distinct embryonic origins. Mitral and tufted cells are glutamatergic projection neurons that arise from dorsal telencephalic (that is, pallial) progenitors between embryonic day (E) 11 and E13 in mouse [1–3]. At E13.5, pallial progenitors also give rise to glutamatergic juxtaglomerular cells, which function as excitatory interneurons . Later, at ~ E14.5, inhibitory OB interneurons, including periglomerular cells and granule cells, begin to differentiate in the lateral ganglionic eminences (LGEs) of the ventral telencephalon, migrating tangentially into the OB [4–6]. Smaller numbers of interneurons are also derived from the ventricular zone (VZ) of the OB , and from subependymal progenitors lining the lateral ventricles throughout life [8, 9]. Development of the OB and OE are intimately intertwined. The OE is populated by OSNs that send pioneer axons to infiltrate the primordial OB beginning at ~ E11.5 in mouse [10, 11]. Signals derived from pioneer OSNs are thought to reduce relative rates of cell proliferation in the rostral telencephalon, resulting in OB evagination and tissue morphogenesis , events that depend on Fgfr1 signaling . There is also evidence that OSN innervation influences neuronal migration in the OB, as revealed by Dlx5 Fezf1 and Arx mutations, all of which display defects in OSN innervation that are accompanied by the generation of a smaller OB and aberrant interneuron migration [13–16]. The proneural genes Neurog1 and Neurog2 encode basic helix–loop–helix transcription factors that specify a dorsal regional identity and glutamatergic neurotransmitter phenotype in the neocortex [17–19]. Mitral, tufted and juxtaglomerular cells are labeled in Neurog1 and Neurog2 lineage traces, indicative of a pallial origin for these OB neurons [1, 20]. While Neurog1 mutants have been reported to develop a smaller OB , the underlying cellular defects have not been characterized, and the role of Neurog2 in OB development has yet to be assessed. Moreover, while there is a partial loss of OSNs in Neurog1 −/− OEs [22, 23], it is not known whether the remaining OSNs differentiate normally. Here we find that Neurog1/2 are required in a redundant fashion to specify the identities of glutamatergic OB neurons, including mitral and juxtaglomerular cells. Conversely we show that only Neurog1 is required for OB morphogenesis and to promote the differentiation of OSNs and their subsequent innervation of the OB. Neurog1/2 thus coordinately regulate development of the olfactory system. The proneural genes Neurog1 and Neurog2 are co-expressed in dorsal telencephalic (that is, pallial) progenitors [18, 19, 24], including those that give rise to glutamatergic neuronal lineages in the neocortex and OB [1, 20]. To begin to assess how Neurog1 and Neurog2 might function together during OB development, we first compared their expression profiles at three key time points: E11.5, prior to the onset of OB differentiation; E12.5, when OB morphogenesis has initiated and mitral cell projection neurons are differentiating, and E13.5, when the first juxtaglomerular cells are born [1–3, 25]. At E11.5, Neurog1 transcripts were detected in only a few cells in the VZ of the dorsal telencephalon, including in the primordial OB at the rostral-most edge (Figure 1A-A"). In contrast, Neurog2 was expressed throughout the E11.5 pallial VZ, including in the presumptive OB (Figure 1B-B"). By E12.5 and at E13.5, when the OB is visible as a morphological protrusion [11, 26], the number of neocortical and OB VZ cells expressing Neurog1 steadily increased (Figure 1C-C",E-E"), while Neurog2 expression remained widespread throughout the neocortical and OB VZs (Figure 1D-D",F-F"). Notably, at all stages analyzed, Neurog1 was also widely expressed throughout the basal OE (Figure 1A-A",C-C",E-E"), as previously documented , whereas Neurog2 expression was limited to a small, ventromedial OE domain (shown at E12.5; Figure 1D"). 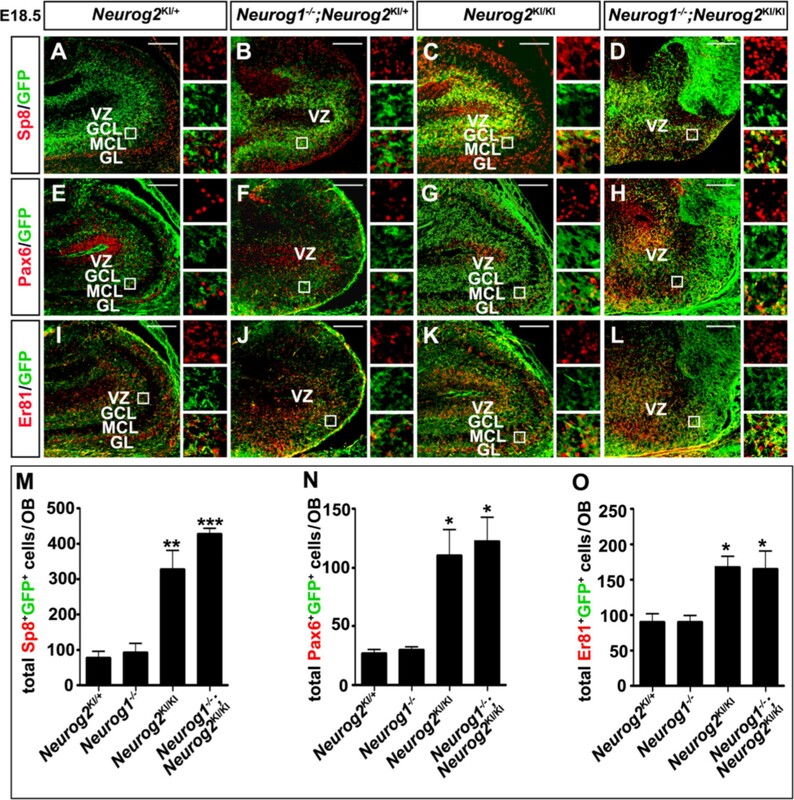 Neurog1 and Neurog2 expression in the embryonic olfactory system. (A) to (F) Sagittal sections of embryonic day (E) 11.5, E12.5 and E13.5 embryos, showing the distribution of Neurog1 (A-A", C-C", E-E") and Neurog2 (B-B", D-D", F-F") transcripts. Insets in A to F are fourfold magnifications of the boxed areas in the OB (A' to F') and OE (A" to F"). (G) to (I) Co-immunolabeling of E13.5 Neurog2 KI/+ brains with antibodies to Neurog1 and Neurog2 (G), Neurog1 and GFP (H), and Neurog2 and GFP (I). Insets in (G) to (I) are fourfold magnifications of the boxed areas. (J) to (L) Co-immunolabeling of the E13.5 OB with Tbr1 and GFP (J,J') and with Tbr2 and GFP (K,K'), and labeling of the E14.5 OB with Dlx2 and GFP (L,L'). Boxed areas in (J) to (L) are magnified twofold in J', K', L' respectively. (M) Schematic representation of Neurog1 single-positive OE progenitors (green) and Neurog1/Neurog2 double-positive progenitors (yellow) in the OB and a small region of the OE. (N) Schematic illustration of the objectives of this study; to determine the roles of Neurog1 and Neurog2 in olfactory system development. dTel, dorsal telencephalon; OB, olfactory bulb; OE, olfactory epithelium; vTel, ventral telencephalon. Scale bars: 1 mm (A) to (F), 250 μm (G) to (L), 125 μm (J') to (L'). 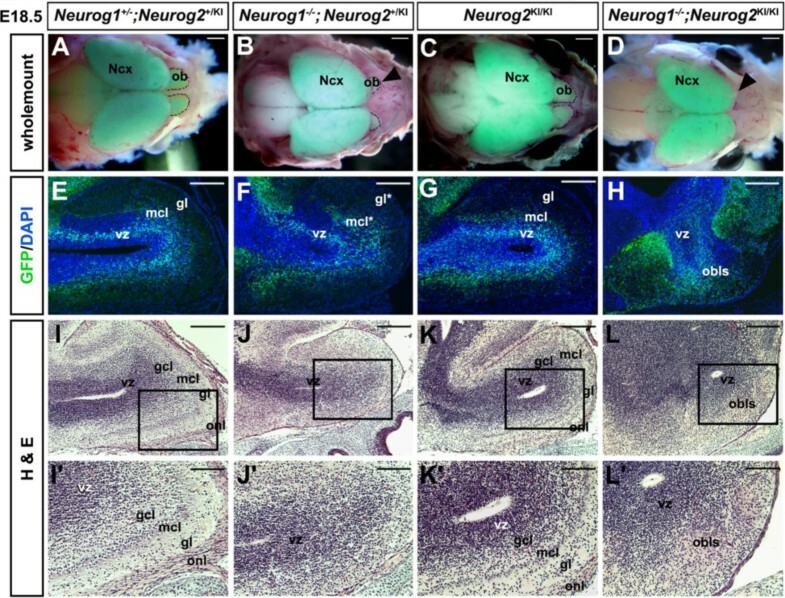 Immunostaining at E13.5 confirmed that Neurog1 and Neurog2 proteins were indeed co-expressed in pallial progenitors, including in the presumptive neocortex, as previously demonstrated , and in the developing OB (Figure 1G). Recent long-term and short-term fate-mapping studies have indicated that Neurog1 and Neurog2 are expressed in all glutamatergic neuronal lineages in the OB, including mitral and tufted cell projection neurons and juxtaglomerular cells in the glomerular layer (GL). To determine to what extent Neurog1 and Neurog2 were expressed in the same or different OB lineages, we used a Neurog2GFP knock-in (KI) allele (Neurog2KI) to perform short-term GFP-lineage tracing of Neurog2-expressing cells and their progeny . The vast majority (if not all) Neurog1-positive (Figure 1H) and Neurog2-positive (Figure 1I) VZ progenitors in the OB co-expressed GFP, suggesting that Neurog1 and Neurog2 are indeed co-expressed within the same OB lineage(s). GFP expression also persisted in Neurog2+/KI OB cells migrating out of the VZ, including those cells that had stopped expressing Neurog1 and Neurog2, allowing the fate of these cells to be assessed with molecular markers (Figure 1J,K,L). GFP+ cells in the mantle layer of the E13.5 Neurog2+/KI OB co-expressed Tbr1 (Figure 1J,J') and Tbr2 (Figure 1K,K'), markers of dorsally-derived, glutamatergic neurons [27, 28], as recently reported . In contrast, GFP+ cells did not express the ventral-specific regional marker Dlx2 in E14.5 Neurog2+/KI embryos (Figure 1L,L'). These data demonstrate that Neurog1 and Neurog2 are largely co-expressed in pallial progenitors, including those that give rise to Tbr1+ and Tbr2+ glutamatergic neurons in the developing OB (Figure 1M). In contrast, only Neurog1 is expressed to a significant extent in OE lineages (Figure 1M), raising the question of how these proneural genes coordinately regulate development of the olfactory system (Figure 1N). To determine whether Neurog1 and Neurog2 are required for OB development, we used a loss-of-function approach, analyzing Neurog1 and Neurog2GFP KI single and double null mutants. In E18.5 wild-type (Figure 2A) and Neurog2 KI/KI mutant (Figure 2C) embryos, the OB was visible as a distinct morphological protrusion of the ventroanterior brain. In comparison, the OB was much smaller in Neurog1 −/− embryos (Figure 2B), and a morphologically distinct OB was not apparent in Neurog1 −/− ;Neurog2 KI/KI double mutants (Neurog1/2 −/− ; Figure 2D). To examine OB development at the cellular level, we first monitored GFP expression from the Neurog2KI allele, which serves as a short-term lineage trace of mitral, tufted and juxtaglomerular lineages . In E18.5 double heterozygotes and Neurog2 KI/KI and Neurog1 −/− null mutants (the latter maintained on a Neurog2 KI/+ background), GFP-labeled cells were detected in the OB VZ and developing mitral cell layer (MCL). In Neurog1−/− OBs, GFP+ cells in the glutamatergic OB lineages were disorganized and formed a less distinct MCL (Figure 2E,F,G). Strikingly, in sections through the Neurog1/2 −/− double-mutant forebrain, an OB-like structure (OBLS) with a central ventricle that was surrounded by GFP+ cells was detected in an aberrant location in the ventrolateral brain (Figure 2H). To further characterize the laminar organization of the proneural mutant OBs, E18.5 sagittal sections were stained with H & E. In H & E-stained wild-type (Figure 2I,I') and Neurog2 KI/KI (Figure 2K,K') mutant OBs, a distinct VZ, granule cell layer, MCL, GL and outer nerve layer (ONL) were apparent. In contrast, most of the post-mitotic neuronal layers were indistinct in the E18.5 Neurog1 −/− OB (Figure 2J,J') and Neurog1/2 −/− OBLS (Figure 2L,L'), although a VZ and granule cell layer were discernible in both mutants. Defects in olfactory bulb morphogenesis and lamination in Neurog1 −/− and Neurog1 −/− ;Neurog2 KI/KI mutant embryos. (A) to (D) Whole-mount dorsal views of partially dissected embryonic day (E) 18.5 wild-type (A), Neurog1−/− (B), Neurog2 KI/KI (C), and Neurog1/2 −/− (D) brains, all heterozygous or homozygous for a Neurog2 GFPKI allele. Brains were left in the cranium and imaged by merging bright-field and GFP fluorescent images. Arrowheads mark the reduction in OB size in Neurog1 −/− embryos (B), and apparent loss of the OB in Neurog1/2 −/− embryos (D). (E) to (H) GFP epifluorescence (green) and nuclear DAPI staining (blue) of sagittal sections through E18.5 wild-type (E), Neurog1−/− (F), Neurog2KI/KI (G), and Neurog1/2−/− (H) OBs. (I) to (L) H & E histological analysis of E18.5 wild-type (I,I'), Neurog1−/− (J,J'), Neurog2KI/KI (K,K'), and Neurog1/2−/− (L,L') OBs. (I') to (L') are twofold magnifications of the boxed areas in (I) to (L), respectively. GCL, granule cell layer; Gl, glomerular layer; MCL, mitral cell layer; NCX, neocortex; OB, olfactory bulb; OBLS, olfactory bulb-like structure; ONL, outer nerve layer; VZ, ventricular zone. Scale bars: 2 mm (A) to (D), 500 μm (E) to (L), 250 μm (I') to (L'). 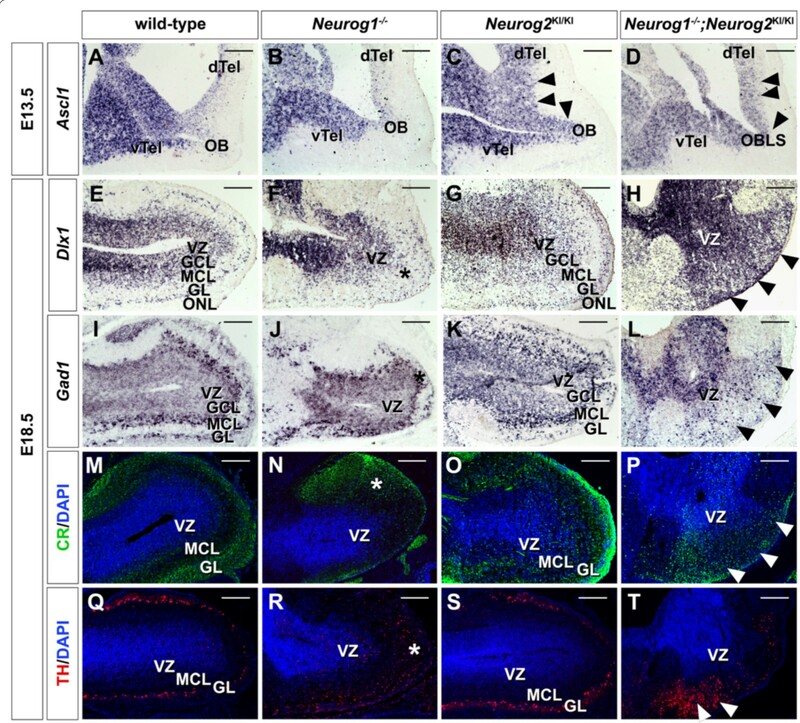 We thus conclude that Neurog1 is required for proper growth and lamination of the OB, whereas Neurog1 and Neurog2 are together required for overall OB morphogenesis. We set out to identify the underlying cause(s) for the morphological and laminar defects in these proneural mutants. The disruption of lamination in E18.5 Neurog1−/− OBs and Neurog1/2 −/− OBLSs suggested that the neuronal subtypes that populate these layers may not differentiate properly. To test this, we first examined glutamatergic OB lineages, which are derived from Neurog1-expressing and Neurog2-expressing pallial progenitors, including projection neurons (mitral and tufted cells) and interneurons (juxtaglomerular cells) (see above, and [1, 20]). To label projection neurons in the MCL, we used a panel of dorsal telencephalic-specific markers, including NeuroD6 Tcfap2e Nrp1 NeuroD1 Reelin, Tbr1 and Tbr2 (Figure 3 and data not shown). Notably, Tcfap2e also labels OB progenitors, and is one of the few definitive markers of an OB identity as it is not also expressed in neocortical lineages , unlike the rest of the markers we employed. To unambiguously identify the OBLS in Neurog1/2 −/− double mutants, the anterior olfactory nucleus (AON), which lies between the neocortex and OB, was used as a landmark. In E18.5 Neurog2KI/+ embryos, the AON was labeled by GFP (data not shown), indicating that it is also derived from Neurog2-expressing pallial progenitors. In all E18.5 Neurog1/2 single and double mutants, the AON expressed GFP (data not shown), Neurod6 (Figure 3A,B,C,D) and Tbr1 (data not shown), indicating that AON development is not grossly perturbed by the loss of these proneural genes. Impaired lamination and differentiation of excitatory neurons in Neurog1/2 −/− single and double mutant olfactory bulbs. (A) to (X) Expression of NeuroD6 (A) to (D), Tcfap2e (E) to (H), Tbr1 (I) to (L), Tbr2 (M) to (P), vGlut1 (green)/DAPI (blue) (Q) to (T) and vGlut2 (green)/DAPI (blue) (U) to (X) in embryonic day 18.5 wild-type (A,E,I,M,Q,U), Neurog1 −/− (B,F,J,N,R,V), Neurog2KI/KI (C,G,K,O,S,W) and Neurog1/2−/− (D,H,L,P,T,X) olfactory bulbs (OBs). White arrowheads in R,V,T,X mark diminished vGlut1/2 protein expression in the peripheral glomerular layer (GL). AON, anterior olfactory nucleus; MCL, mitral cell layer; OBLS, olfactory bulb-like structure; VZ, ventricular zone. Scale bars: 1 mm (A) to (D), 500 μm (E) to (X). In the main OB, expression of NeuroD6, Tcfap2e, Tbr1 and Tbr2 was detected in the OB VZ and MCL in E18.5 wild-type and Neurog2 KI/KI null embryos (Figure 3A,C,E,G,I,K,M,O). In contrast, NeuroD6, Tcfap2e, Tbr1 and Tbr2-expressing cells were generated, but were disorganized in E18.5 Neurog1−/− OBs, occupying ectopic positions in the outermost portion of the OB, where a mitral cell-deficient GL would normally form (Figure 3B,F,J,N). Strikingly, NeuroD6, Tcfap2e, Tbr1 and Tbr2 expression was also detected in the aberrantly localized OBLS in E18.5 Neurog1/2 −/− embryos, although the number of Tcfap2e-positive cells was markedly reduced (Figure 3D,H,L,P). Neurog1/2 are thus required for the lamination of MCL projection neurons in the OB, and may together be required for the differentiation of these cells. We next asked whether Neurog1/2 were required for the differentiation of glutamatergic juxtaglomerular cells in the GL, which includes external tufted and short axon cells that are labeled by vesicular glutamate transporter 1 (vGlut1) and vGlut2 [1, 31, 32]. In E18.5 wild-type (Figure 3Q,U) and Neurog2KI/KI (Figure 3S,W) OBs, vGlut1 labeled a large number of juxtaglomerular cell bodies and their projections, while vGlut2 expression was confined to the ONL in the periphery of the GL. In Neurog1 −/− OBs, vGlut1 and vGlut2 staining was strongly reduced in the presumptive GL, and an ectopic cluster of vGlut1/2-labeled cells aggregated in the dorsal OB (Figure 3R,V). Similarly, while scattered vGlut1/2-immunoreactive cells were detected throughout the Neurog1/2 −/− OBLS, a distinct GL was not evident in these embryos (Figure 3T,X). Finally, to quantitate glutamatergic neurons in the OB, we analyzed the expression of Tbr2, a pan-glutamatergic neuronal marker, and Tbr1, which labels MCL projection neurons and short axon juxtaglomerular cells in the GL (Figure 4A to J). Cell counts were performed at E13.5, when the vast majority of glutamatergic OB neurons have differentiated [1–3]. We observed a significant reduction in the number of Tbr1+ (wild-type and Neurog2 KI/KI n = 4; Neurog1 −/− and Neurog1/2 −/− n = 3) and Tbr2+ (wild-type and Neurog2 KI/KI n = 4; Neurog1 −/− and Neurog1/2 −/− n = 3) glutamatergic neurons only in the Neurog1/2 −/− double-mutant OBLS compared with wild-type OBs (P <0.05 for both Tbr1 and Tbr2 counts; Figure 4I,J). Defects in the differentiation of glutamatergic olfactory bulb neurons in Neurog1/2 double mutants. (A) to (H) Expression of Tbr1 (A) to (D) and Tbr2 (E) to (H) in the presumptive MCL of embryonic day (E) 13.5 wild-type (A,E), Neurog1 −/− (B,F), Neurog2 KI/KI (C,G) and Neurog1/2 −/− (D,H) OBs. White arrowheads in D,H mark the reduction in glutamatergic neurons in Neurog1/2−/− OBs. White asterisks in (A) to (H) mark the ventricular zone. 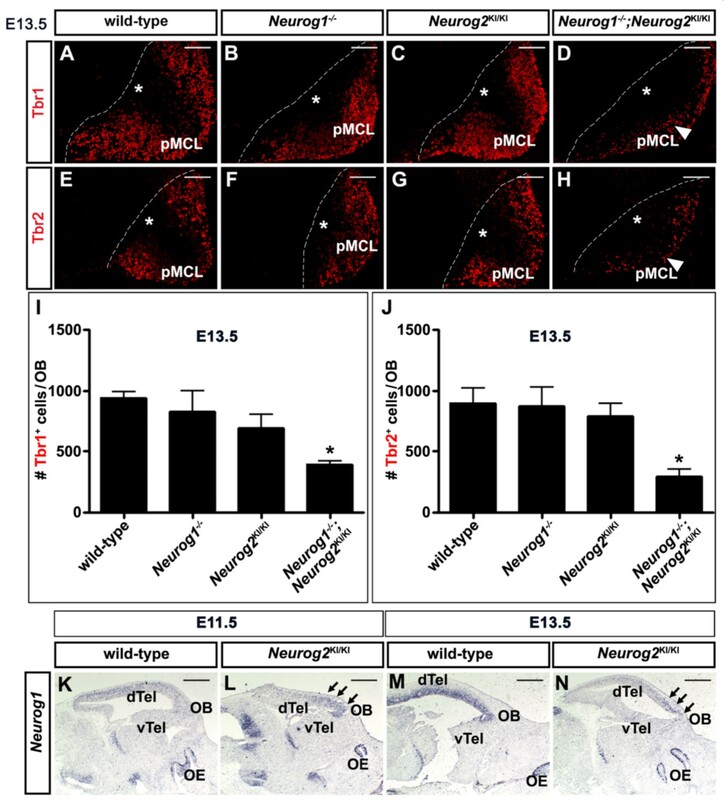 (I), (J) Quantitation of total numbers of Tbr1+ cells (I) and Tbr2+ cells (J) in E13.5 wild-type Neurog1 −/− , Neurog2KI/KI and Neurog1/2−/− OBs. Asterisks denote P <0.05. (K) to (N) Analysis of Neurog1 expression in E11.5 (K,L) and E13.5 (M,N) wild-type and Neurog2 −/− telencephalons. Arrows mark ectopic Neurog1 expression in (L) and (N). Scale bars: 250 μm (A) to (H), 1 mm (K) to (N). We thus conclude that glutamatergic mitral and juxtaglomerular cells are born in normal numbers in Neurog2 KI/KI and Neurog1−/− single-mutant OBs, but these cells migrate inappropriately and fail to take up their correct positions in the Neurog1−/− MCL and GL. In contrast, fewer glutamatergic neurons are born in the Neurog1/2 −/− OBLS, and these cells also migrate aberrantly. The lack of an apparent defect in the Neurog2−/− OB (at least at the morphological level and in glutamatergic lineages) was surprising given that fewer glutamatergic neurons are generated in Neurog2−/− single-mutant neocortices. We previously attributed the Neurog2 −/− neocortical phenotype to a downregulation of Neurog1 expression in dorsomedial telencephalic domains, such that Neurog2 −/− and Neurog1/2 −/− embryos are equivalent (that is, both lack Neurog1 and Neurog2 expression) in this part of the developing neocortex . We therefore asked whether Neurog1 expression was similarly lost in the presumptive OB region of Neurog2 −/− embryos. 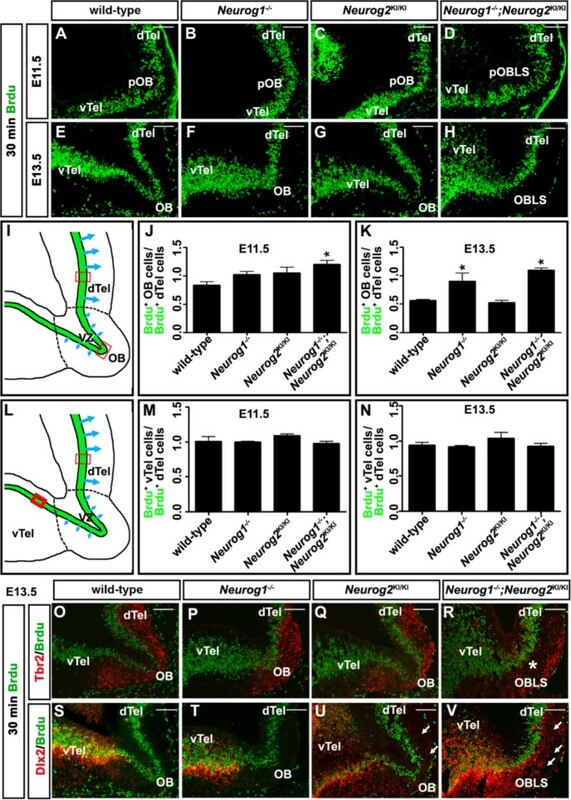 Strikingly, we found that Neurog1 was instead upregulated in the Neurog2 −/− rostral telencephalon (presumptive OB) at both E11.5 (Figure 4K,L) and to a lesser extent at E13.5 (Figure 4M,N). In contrast, Neurog1 expression was reduced throughout most of the remainder of the Neurog2 −/− dorsal telencephalon, as previously documented . These data are consistent with the idea that Neurog1 may compensate for the loss of Neurog2 in the developing OB. Beginning at ~ E12.5, the OB is first evident as a distinct rostral protuberance of the telencephalon [11, 26]. In our analysis of glutamatergic neuronal markers, we observed a shortening of the proximal–distal telencephalic axis in Neurog1 −/− mutants as early as E13.5, while a morphologically distinct OB was not evident in Neurog1/2 −/− mutants at any stage analyzed (between E12.5 and E18.5; data not shown). At these early stages, the driving force of OB morphogenesis is thought to be a reduction in proliferation at the rostral edge of the telencephalon, which results in the neocortex ballooning out while the presumptive OB is left behind [11, 26]. To determine whether aberrant patterns of proliferation contributed to the morphogenetic defects observed in Neurog1 −/− and Neurog1/2 −/− OBs, dividing S-phase progenitors were labeled with a 30-minute BrdU pulse and labeled progenitors were then enumerated in fields of equal size in the presumptive neocortex (dorsal telencephalon) and OB (Figure 5A to K). The presumptive OB was identified at these early stages as the midpoint of the telencephalic continuum surrounding the lateral ventricles. Specifically, the OB is flanked by dorsal and ventral telencephalic domains, both of which have distinct morphological features, and the borders of which were precisely identified by BrdU co-labeling with Tbr2 (dorsal) or Dlx2 (ventral). Aberrant patterns of cell proliferation in Neurog1/2 −/− mutants. (A) to (H) BrdU-labeled S-phase progenitors at embryonic day (E) 11.5 (A) to (D), and E13.5 (E) to (H) in wild-type (A,E), Neurog1 −/− (B,F), Neurog2 KI/KI (C,G), and Neurog1/2−/− (D,H) OBs. (I) to (K) Illustration schematizing areas where counts of BrdU-labeled S-phase progenitors were performed (I). Quantitation of the ratio of BrdU+ cells in the OB compared with the dorsal telencephalon at E11.5 (J) and E13.5 (K). Asterisks denote P <0.05. (L) to (N) Illustration schematizing areas where counts of BrdU-labeled S-phase progenitors were performed (L). Quantitation of the ratio of BrdU+ cells in the ventral compared with the dorsal telencephalon at E11.5 (M) and E13.5 (N). (O) to (V) Co-labeling of BrdU+ S-phase progenitors (green) with either Tbr2 (red, O to R) or Dlx2 (red, S to V) in E13.5 wild-type (O,S), Neurog1 −/− (P,T), Neurog2KI/KI (Q,U), and Neurog1/2−/− (R,V) embryos. dTel, dorsal telencephalon; OB, olfactory bulb; pOB, presumptive olfactory bulb; pOBLS, presumptive olfactory bulb like structure; vTel, ventral telencephalon. Scale bars: 250 μm (A) to (H), (O) to (V). OB/dorsal telencephalic proliferation ratios were compared across all Neurog1/2 genotypes. At E11.5, when the OB is not yet distinct, the ratio of S-phase progenitors in the OB versus dorsal telencephalon was similar in wild-type embryos (83.3 ± 6.5%, n = 4; Figure 5A,J), Neurog1 −/− embryos (102.6 ± 5.1%, P >0.05, n = 4; Figure 5B,J) and Neurog2 KI/KI embryos (105.0 ± 9.9%, P >0.05, n = 3; Figure 5C,J). In contrast, the ratio of BrdU-labeled progenitors in the OB versus dorsal telencephalon was 120.5 ± 6.7% in E11.5 Neurog1/2 −/− double mutants, 1.4-fold higher than in wild-type embryos (P = 0.02, n = 3; Figure 5D,J). OB proliferation rates are thus aberrantly high in Neurog1/2 −/− double mutants as early as E11.5. We next examined proliferating pallial progenitors at E13.5, when the OB is morphologically distinct (Figure 5E,F,G,H,K). In E13.5 wild-type embryos, the ratio of BrdU-labeled VZ progenitors in the OB versus dorsal telencephalon had declined to 56.3 ± 1.6% (n = 5; Figure 5E,K), indicative of a reduction in relative rates of OB proliferation, consistent with previous reports [11, 12, 26]. In E13.5 Neurog2 KI/KI embryos, which develop a morphologically normal OB, a similar OB/dorsal telencephalon proliferation ratio was observed (52.8 ± 3.5%, n = 3; Figure 5G,K). In contrast, the ratio of proliferating progenitors in the OB versus dorsal telencephalon was aberrantly high in E13.5 Neurog1 −/− OBs (90.4 ± 14.0%, P <0.001, n = 3; Figure 5F,K) and Neurog1/2 −/− OBLSs (109.5 ± 3.7%, P <0.001, n = 3; Figure 5H,K). To confirm that the OB/dorsal telencephalon proliferation ratios were not altered in Neurog1 or Neurog2 single mutants because of a defect in the neocortex (as opposed to OB), we also compared the ratios of BrdU+ cells in the dorsal versus ventral telencephalon (Figure 5L,M,N). Note that neither Neurog1 nor Neurog2 are expressed in the ventral telencephalon, so proliferation rates should not be altered in this domain in mutants (serving as an internal control). Consistent with the lack of a defect in neocortical cell proliferation in Neurog1/2 single and double mutants, at both E11.5 (Figure 5M) and E13.5 (Figure 5N), the ratios of BrdU-labeled ventral versus dorsal telencephalic progenitors were similar in all genotypes (P >0.05 for all pairwise comparisons against wild-type). We thus conclude that prospective OB progenitors fail to reduce their relative proliferation rates in Neurog1 −/− and Neurog1/2 −/− mutants, probably contributing to the observed OB morphogenesis defects. To further characterize proliferation defects in early OB development, we examined the spatial arrangement of BrdU-labeled S-phase progenitors in the E13.5 VZ with respect to differentiating mitral cells. Early-born mitral cells migrate radially from the OB VZ, using radial glia as a scaffold, while later-born mitral cells shift to a tangential pattern of migration, coursing through the intermediate zone of the OB in close proximity to tangentially oriented axons of early-born mitral cells [10, 33]. Consequently, mitral cells generated at E10 show a bias towards dorsomedial positions, while tangentially migrating cells born at E12 preferentially accumulate in ventrolateral domains. In E13.5 wild-type OBs (Figure 5O) and Neurog2KI/KI OBs (Figure 5Q), Tbr2+ mitral cells had migrated throughout the mantle layer of the OB, lining the OB surface along the entire dorsal-to-ventral axis, but were less abundant in a central zone at the rostral tip. In E13.5 Neurog1 −/− OBs (Figure 5P), the distribution of Tbr2+ cells was altered, such that a Tbr2-deficient zone at the rostral tip was not observed, suggestive of early defects in cell migration. These migratory defects were more severe in E13.5 Neurog1/2 −/− OBLSs, in which a distinct gap was evident between the BrdU-labeled progenitor zone and the Tbr2+ mantle layer (Figure 5R). Migration defects are thus evident as early as E13.5 in Neurog1 −/− and Neurog1/2 −/− OBs. In the embryonic neocortex, Neurog1 and Neurog2 regulate a binary fate decision, promoting a dorsal regional identity and glutamatergic neurotransmitter phenotype while repressing an alternative ventral, GABAergic neuronal identity [18, 19]. We thus speculated that the reduction in glutamatergic neuronal number in the Neurog1/2 −/− OBLS may be due to a similar fate switch. To test this, E13.5 embryos were labeled with Dlx2, which together with Dlx1 is required for the generation of almost all GABAergic and dopaminergic interneurons in the OB [13, 34, 35]. While Dlx2 was widely expressed in the mantle zone of the E13.5 ventral telencephalon, only a few Dlx2+ cells had infiltrated the wild-type (Figure 5S) and Neurog1−/− (Figure 5T) OBs at this stage. In contrast, Dlx2-labeled neurons were abundant in the E13.5 Neurog1/2 −/− OBLS (Figure 5V), lying directly adjacent to the BrdU-labeled progenitor zone in the VZ, and filling the gap between the Tbr2+ and BrdU+ zones. Some Dlx2+ cells were also detected in ectopic sites in the Neurog2KI/ KI OB (Figure 5U). Interneurons thus appeared to be generated at the expense of glutamatergic neurons in the Neurog1/2 −/− OBLS, and possibly also in Neurog2 KI/KI OBs. In the neocortex, the ventralization of Neurog2 KI/KI and Neurog1/2 −/− progenitors arises due to the increased expression of Ascl1[18, 19], a proneural gene that is required for the generation of GABAergic neurons in the ventral telencephalon [36, 37], and a subset of periglomerular cells in the embryonic OB  and adult OB . 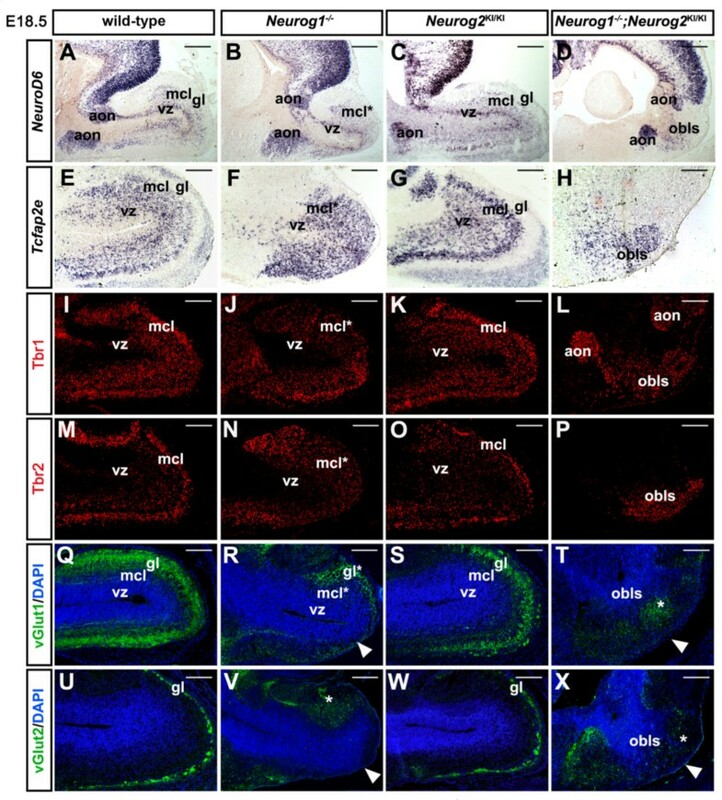 Ascl1 expression was also upregulated in the E13.5 OB VZ in Neurog2 KI/KI and Neurog1/2 −/− embryos (Figure 6A,B,C,D), consistent with a similar mechanism underlying the misspecification of OB neurons. To further analyze the ectopic differentiation of OB interneurons, E18.5 OBs were analyzed for the expression of Dlx1, which labels OB progenitors and postmitotic granule and periglomerular cells in the granule cell layer and GL, as well as glutamate decarboxylase 1 (GAD1), which labels all GABAergic OB interneurons in the granule cell layer and GL , calretinin, which labels most granule cells and a subset of periglomerular cells , and TH, which labels dopaminergic periglomerular cells (Figure 6 to T E) . In E18.5 Neurog1 −/− OBs, a distinct GL was not evident, and instead, neurons labeled with Dlx1 GAD1, and calretinin and TH were scattered throughout the mantle zone of the OB (Figure 6F,J,N,R). In E18.5 Neurog2 KI/KI OBs, the GL was clearly marked by Dlx1 GAD1, and calretinin, but a scattering of ectopic interneurons labeled by these markers was also detected between the MCL and GL (Figure 6G,K,O). While TH+ cells were not located in ectopic sites in E18.5 Neurog2 KI/KI OBs, they formed a less compact layer (Figure 6S). Finally, in Neurog1/2 −/− OBLSs, there was a striking expansion of Dlx1 GAD1, calretinin and TH expression domains, which spread out radially from the VZ of the OBLS to reach the pial surface of the brain (Figure 6H,L,P,T). Ectopic differentiation of olfactory bulb interneurons in Neurog2 KI/KI and Neurog1/2 −/− embryos. (A) to (D) Expression of Ascl1 in embryonic day (E) 13.5 wild-type (A), Neurog1−/− (B), Neurog2KI/KI (C), and Neurog1/2−/− (D) OBs. (E) to (T) Expression of Dlx1 (E) to (H), Gad1 (I) to (L), calretinin (CR) (M) to (P) and TH (Q) to (T) in E18.5 wild-type, (E,I,M,Q), Neurog1 −/− (F,J,N,R), Neurog2KI/KI (G,K,O,S), and Neurog1/2−/− (H,L,P,T) OBs. Blue is DAPI nuclear stain in (M) to (T). Arrowheads in (C,D) mark the upregulated expression of Ascl1 in the OB of Neurog2KI/KI and OBLS of Neurog1/2−/− embryos. Arrowheads in (H,L,P,T) mark expansion of expression domain from VZ to pial surface in Neurog1/2−/− OBs. Asterisks in (F,J,N,R) mark ectopic interneurons in Neurog2KI/KI OBs. dTel, dorsal telencephalon; GL, glomerular layer; GCL, granule cell layer; MCL, mitral cell layer; OB, olfactory bulb; OBLS, olfactory bulb-like structure; ONL, olfactory nerve layer; vTel, ventral telencephalon; VZ, ventricular zone. Scale bars: 500 μm (A) to (T). Aberrantly positioned OB interneurons could signify an increase in migration from ventral domains or a respecification of dorsal progenitors to acquire an aberrant ventral identity. While our previous results in the neocortex favor a respecification model, to formally test this, we performed Neurog2 short-term lineage tracing with the Neurog2GFP KI allele. Note that we have extensively compared molecular marker expression in wild-type and Neurog2KI/+ brains (including the OB) and have no evidence for a heterozygous phenotype. We therefore analyzed GFP co-expression with three transcription factors expressed in OB interneuron populations ; namely Sp8, which is expressed in calretinin+, parvalbumin+ and GABAergic periglomerular and granule cells [41, 42]; Pax6, which is required to generate the majority of granule cells along with dopaminergic (TH+) periglomerular cell progenitor subtypes [43, 44]; and Er81, which labels VZ progenitors, granule cells and dopaminergic periglomerular cells . As expected, minimal GFP/Sp8 co-labeling was detected in E18.5 Neurog2KI/+ (that is, wild-type control; Figure 7A,M) and Neurog2KI/+;Neurog1−/− OBs (Figure 7B,M). In contrast, in E18.5 Neurog2KI/KI OBs (4.2-fold increase; P <0.001; Figure 7C,M) and Neurog1/2 −/− OBLSs (5.5-fold increase; P <0.0001; Figure 7D,M) there was a significant increase in number of GFP/Sp8 co-labeled cells throughout the OB. Similarly, the numbers of Pax6+GFP+ (Figure 7E,F,G,H,N) and Er81+GFP+ (Figure 7I,J,K,L,O) double-positive interneurons were also significantly higher in Neurog2 KI/KI OBs (Pax6+GFP+: 4.07-fold increase, P <0.05; Er81+GFP+: 1.87-fold increase, P <0.05) and Neurog1/2 −/− OBLSs (Pax6+GFP+: 4.52-fold increase, P <0.05; Er81+GFP+: 1.83-fold increase, P <0.05). Neuronal misspecification defects in Neurog2 −/− olfactory bulbs and Neurog1/2 −/− olfactory bulb-like structures. (A) to (L) Co-immunostaining of GFP (green, A to L) with Sp8 (red, A to D), Pax6 (red, E to H) or Er81 (red, I to L) in E18.5 wild-type, (A,E,I), Neurog1 −/− (B,F,J), Neurog2KI/KI (C,G,K), and Neurog1/2−/− (D,H,L) OBs. Insets to the right of each panel are fourfold magnifications of boxed areas. (M) to (O) Quantitation of total Sp8+GFP+ cells (M), Pax6+GFP+ cells (N), and Er81+GFP+ cells (O) in embryonic day 18.5 wild-type, Neurog1 −/− , Neurog2KI/KI and Neurog1/2−/− OBs. *P <0.05, **P <0.01, ***P <0.005. GCL, granule cell layer; GL, glomerular layer; MCL, mitral cell layer; VZ, ventricular zone. Scale bars: 500 μm (A) to (L). In Neurog2 KI/KI OB and Neurog1/2 −/− OBLSs, therefore, a subset of pallial progenitors that should give rise to glutamatergic OB projection neurons are misspecified, instead differentiating into GABAergic interneurons. In contrast, neuronal misspecification defects are not observed in Neurog1 −/− OBs, although the migration of GABAergic OB neurons is strikingly perturbed. At first glance, the defective migration of OB interneurons in Neurog1 −/− and Neurog1/2 −/− embryos was unexpected, given that these proneural genes are not expressed in OB interneuron lineages . However, several studies have indicated that OSN innervation is required for OB interneuron migration [13–16], in addition to controlling the proliferation of OB progenitors . Defects in OB interneuron migration could thus be non-cell autonomous in Neurog1 −/− and Neurog1/2 −/− double mutants. Consistent with this model, Neurog1 is expressed in OE progenitors, where it is required for the differentiation of a subset of OSNs at early stages of development , although innervation patterns were not examined. To determine whether OSN innervation was indeed perturbed in the absence of Neurog1 function, we monitored the expression of growth-associated protein 43 (GAP43) and olfactory marker protein (OMP), which mark both the cell bodies and axonal projections of immature (GAP43) and mature (OMP) OSNs [11, 46]. In coronal sections through E18.5 wild-type (Figure 8A,E) and Neurog2 KI/KI (Figure 8C,G) OBs, GAP43-labeled and OMP-labeled OSN axons emanated from the OE, traversing the cribriform plate to penetrate the ONL, where they wrapped the entire periphery of the OB. In contrast, in E18.5 Neurog1 −/− (Figure 8B,F) and Neurog1/2 −/− (Figure 8D,H) embryos, GAP43 and OMP labeled a fibrocellular mass (FCM) that did not penetrate the OB. Only a small amount of GAP43 and OMP expression was observed surrounding caudal regions of the Neurog1 −/− OB, suggesting that very few OSN axons innervated the mutant OB (Figure 8B,F). As a side note, the term FCM was first coined to describe the extratoes (that is, Gli3−/−) olfactory phenotype, and refers to an amorphous bundle of OSN axons that fail to extend and penetrate the OB . To assess OSN innervation along the entire rostrocaudal axis, we also examined sagittal sections of E18.5 Neurog1 −/− (Figure 9B,F) and Neurog1/2 −/− (Figure 9D,H) embryos with calretinin (data not shown), GAP43 (Figure 9A,B,C,D) and OMP (Figure 9E,F,G,H), revealing that defects in OSN axon innervations of the OB were observed at all levels. Neurog1 −/− and Neurog1/2 −/− olfactory sensory neurons express mature markers but fail to innervate olfactory bulb. (A) to (H) Coronal sections of the embryonic day (E) 18.5 OB showing expression of GAP43 (red, A to D) and OMP (green, E to H) with DAPI (blue, A to H) in wild-type (A,E), Neurog1 −/− (B,F), Neurog2KI/KI (C,G) and Neurog1/2−/− (D,H) embryos. Yellow arrows denote loss of OSN innervation of the OB in Neurog1 −/− and Neurog1/2−/− (B,D,F,H) embryos. (I) to (T) Expression of odorant receptors L45 (I) to (L), M72 (M) to (P) and P2 (Q) to (T) in E18.5 wild-type (I,M,Q), Neurog1 −/− (J,N,R), Neurog2KI/KI (K,O,S) and Neurog1/2−/− (L,P,T) embryos. Note that the lack of an apparent OB in Neurog1−/− sections is because the OB is shortened along the proximodistal axis, and hence does not fill the rostral-most part of the cavity in the skull, where OR expression levels are the highest (J,N,R). GAP43, growth-associated protein 43; OB, olfactory bulb; OE, olfactory epithelium; OMP, olfactory marker protein; OSN, olfactory sensory neuron. Scale bars: 500 μm (A) to (T). Neurog1 −/− and Neurog1/2 −/− olfactory sensory neurons express neurotrophic receptors and ligands but fail to innervate olfactory bulb. (A) to (H) Expression of GAP43 (red, A to D) and OMP (green, E to H) with DAPI counterstain (blue, A to H) in embryonic day (E) 18.5 wild-type (A,E), Neurog1 −/− (B,F), Neurog2KI/KI (C,G) and Neurog1/2−/− (D,H) OBs/OEs. White arrows denote loss of synaptogenesis between the OE and the OB in Neurog1 −/− and Neurog1/2−/− (B,D,F,H) olfactory systems, and arrowheads point to the accumulation of OSN axons in a FCM. (I) to (T) Expression of Ntrk1 (I) to (L), Ntrk2 (M) to (P) and Ntrk3 (Q) to (T) in E18.5 wild-type (I,M,Q), Neurog1 −/− (J,N,R), Neurog2KI/KI (K,O,S) and Neurog1/2−/− (L,P,T) embryos. (U) to (F') Expression of BDNF (U) to (X), NGF (Y) to (B'), NT3 (C') to (F'), in E18.5 wild-type (U,Y,C'), Neurog1 −/− (V,Z,D'), Neurog2KI/KI (W,A',E') and Neurog1/2−/− (X,B',F') embryos. Black arrows (J,L,N,P,R,T,V,X,Z,B',D',F') indicate loss of marker expression in outer layers of Neurog1 −/− and Neurog1/2−/− OBs. Arrowheads (J,L,R,T,V,X,Z,B',D',F') point to FCM formation in Neurog1 −/− and Neurog1/2−/− embryos. FCM, fibrocellular mass; OB, olfactory bulb; OBLS, olfactory bulb-like structure; OE, olfactory epithelium; ONL, olfactory nerve layer. Scale bars: 500 μm (A) to (Z), (A') to (F'). OSNs express one of ~1,200 odorant receptors (OR) in mice, dictating the type of odor they will respond to, with OSNs that express the same OR targeting the identical glomerulus in the OB [48–50]. Notably, the specificity of OSN targeting depends on ORs, which are functionally required to establish a glomerular topographic map in the OB [51–53]. To determine whether OR expression was maintained in Neurog1/2 −/− OSNs, we examined the expression of three different ORs (L45 M72 P2) that direct the innervation of distinct glomeruli [54, 55]. In coronal sections through E18.5 wild-type OBs (Figure 8I,M,Q) and Neurog2 KI/KI OBs (Figure 8K,O,S), L45 M72 and P2 transcripts were detected in OSN axon bundles that had innervated the OB, concentrating in the ventromedial ONL. In contrast, in E18.5 Neurog1 −/− embryos (Figure 8J,N,R) and Neurog1/2 −/− embryos (Figure 8L,P,T), L45 M72 and P2 were expressed in OSN axons that accumulated in a FCM outside the OB. Neurog1 −/− and Neurog1/2 −/− OSN axons therefore failed to penetrate the OB, even though they continued to express ORs. We next searched for molecular signals that may account for the lack of OSN innervation in Neurog1 −/− and Neurog1/2 −/− OBs. Neurotrophins (NGF BDNF NT3) and their cognate receptors (Ntrk1 Ntrk2 Ntrk3) regulate several cellular processes, including neuronal survival, differentiation and axonal and dendritic growth (reviewed in ). The ligands BDNF NGF and NT3 and the receptors Ntrk1 Ntrk2 and Ntrk3 are all expressed in the olfactory system reviewed in . In sagittal sections through E18.5 wild-type OBs/OEs (Figure 9I,M,Q,U,Y,C') and Neurog2 KI/KI OBs/OEs (Figure 9K,O,S,W,A',E'), BDNF NGF NT3 Ntrk1 Ntrk2 and Ntrk3 were all expressed in a similar fashion, marking OSN axons exiting the OE and innervating the ONL of the OB. In contrast, in E18.5 Neurog1 −/− embryos (Figure 9J,N,R,V,Z,D') and Neurog1/2 −/− embryos (Figure 9L,P,T,X,B',F'), BDNF NGF NT3 Ntrk1 Ntrk2 and Ntrk3 transcripts accumulated in FCMs between the OB and OE, consistent with the inability of OSNs to innervate the OB in these two mutant backgrounds. Taken together, these data show that Neurog1 −/− and Neurog1/2 −/− mutant OSNs fail to innervate the OB, despite their expression of several markers of differentiated OSNs. Neurog1 is thus required to promote OSN axonal extension into the ONL of the OB. To better understand why Neurog1 −/− and Neurog1/2 −/− OSN axons did not penetrate the OB/OBLS, we examined the OE in more detail. In a previous report, it was shown that fewer OSNs express a subset of differentiation markers in the E12.5 Neurog1 −/− OEs . Here we examined OSN differentiation at E18.5, using the pan-neuronal marker SCG10 (Figure 10A,B,C,D) and the mature OSN marker OMP (Figure 10E,F,G,H). Strikingly, there was only a slight reduction in the number of SCG10-labeled and OMP-labeled OSNs in medial domains of the E18.5 Neurog1 −/− OEs (Figure 10B,F) and Neurog1/2 −/− OEs (Figure 10D,H) compared with E18.5 wild-type embryos (Figure 10A,E) and Neurog2 KI/KI embryos (Figure 10C,G). A significant number of OSNs thus differentiate by E18.5 in Neurog1 −/− and Neurog1/2 −/− OEs, despite the earlier block in differentiation . Normal OSN and OEC differentiation in Neurog1 −/− and Neurog2 −/− mutants, but apoptosis elevated in double mutants. (A) to (D) Expression of SCG10 in wild-type (A), Neurog1 −/− (B), Neurog2−/− (C), and Neurog1/2−/− (D) OBs at embryonic day (E) 18.5. (E) to (P) Co-labeling with DAPI (blue, E to P) and OMP (green, E to H), NCAM (green, I to L), GFP (green, M to P), p75 (red, I to L), or S100b (red, M to P) in wild-type (E,I,M), Neurog1 −/− (F,J,N), Neurog2−/− (G,K,O), and Neurog1/2−/− (H,L,P) OBs at E18.5. (Q) to (T) Co-labeling with DAPI (blue) and activated caspase 3 (AC3; red) in wild-type (Q), Neurog1 −/− (R), Neurog2−/− (S), and Neurog1/2−/− (T) OBs at E14.5. (U) to (W) Schematic representation of the three components of the olfactory system (U). The normal process of OSN innervation of the OB, and the subsequent formation of the glomerular layer by migrating OB interneurons (V) is perturbed in Neurog1/2 −/− embryos (W). OB, olfactory bulb; OE, olfactory epithelium; OEC, olfactory ensheathing cell; OSN, olfactory sensory neuron; PC, piriform cortex. Scale bars: 500 μm (A) to (P), 250 μm (Q) to (T). We next examined the differentiation of olfactory ensheathing cells (OECs), which arise in the olfactory placode and wrap around OSN axonal tracts to provide trophic support and promote OSN axonal growth [57, 58]. NCAM, which is expressed in OSNs and OECs, and p75, which specifically labels OECs, co-labeled the olfactory nerve, which infiltrated the ventral surface of the OB in E18.5 wild-type (Figure 10I) and Neurog2 KI/KI (Figure 10K) OEs. In contrast, while NCAM and p75 were co-expressed in the olfactory nerve in E18.5 Neurog1−/− embryos (Figure 10J) and Neurog1/2−/− embryos (Figure 10L), the OEC-wrapped OSNs terminated in a FCM between the OB and OE. Labeling of OECs with S100b similarly revealed that OECs infiltrate the ventral OB in wild-type embryos (Figure 10M) and Neurog2 KI/KI embryos (Figure 10O), whereas OECs accumulate in a FCM in Neurog1 −/− embryos (Figure 10N) and Neurog1/2 −/− embryos (Figure 10P). OSNs and OECs thus differentiate in all Neurog1/2 genotypes, but they fail to innervate the OB in Neurog1 −/− and Neurog1/2 −/− embryos. Finally, we investigated whether apoptosis may contribute to the small decline in OSN numbers in Neurog1 −/− and Neurog1/2 −/− mutants by analyzing the expression of activated caspase 3, a marker of apoptosis. 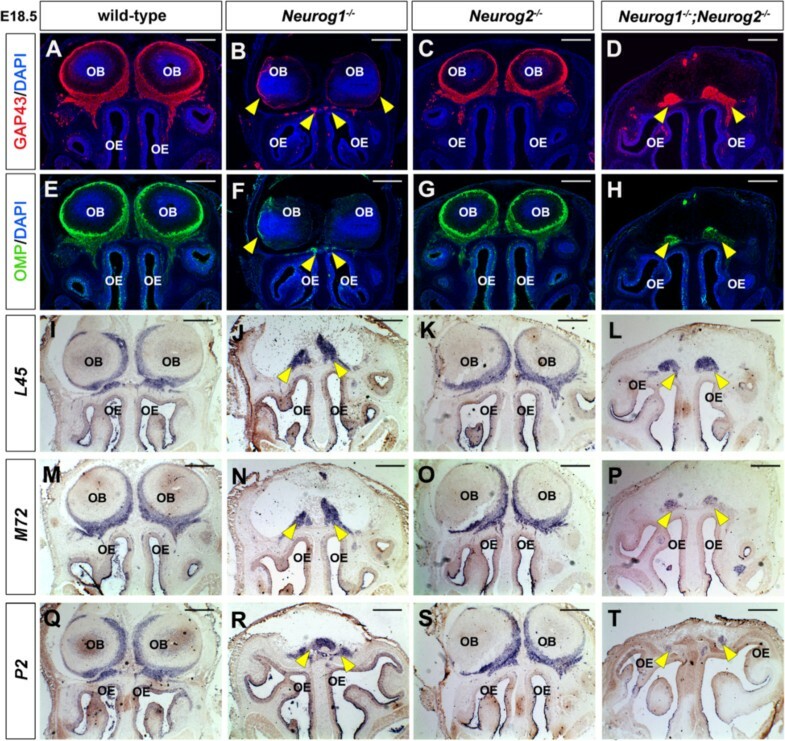 In E14.5 wild-type OEs (Figure 10Q), Neurog1 −/− OEs (Figure 10R) and Neurog2 KI/KI OEs (Figure 10S), only a few scattered activated caspase 3-positive cells were detected, whereas in Neurog1/2 −/− embryos (Figure 10T) there was a notable increase in activated caspase 3 immunolabeling in the OE. Apoptosis thus occurs at elevated levels in the Neurog1/2 −/− OE only, despite Neurog2 not being expressed in the vast majority of OE progenitors. Strikingly, the increase in OE apoptosis in double mutants phenocopies the OE defects observed upon bulbectomy , suggesting that the Neurog1/2 −/− OBLS may fail to provide trophic signals to the OE, as discussed further below. The olfactory system consists of the OB, OE and olfactory cortex, which together are responsible for detecting and processing odors (Figure 10U). Here we provide mechanistic insights into how the development of these olfactory structures is coordinated. We first demonstrate that Neurog1 and Neurog2 function redundantly and in a cell autonomous fashion to specify the glutamatergic neuronal identity of OB projection neurons and juxtaglomerular cells, while suppressing an alternative interneuron fate. In contrast, only Neurog1 is required to regulate OSN innervation of the OB, defects in which can perturb the proliferation rate of OB progenitors, and the migratory routes of OB neurons (Figure 10V,W). In summary, Neurog1 and Neurog2 play an integral role in coordinately regulating development of the olfactory system, regulating cell fate specification in the OB and OSN differentiation and axonal targeting in the OE. Glutamatergic mitral, tufted and juxtaglomerular cells are derived from dorsal telencephalic progenitors, as revealed by Neurog1 and Neurog2 (present study and ) lineage tracing. Accordingly, we found that fewer glutamatergic OB neurons are generated in the absence of Neurog1/2 function. Nevertheless, a subset of mitral and juxtaglomerular cells differentiate in the Neurog1/2 −/− OBLS, suggesting that other genes compensate for the loss of proneural function. Candidate transcriptional regulators that may promote the differentiation of glutamatergic OB neurons in the absence of Neurog1/2 include the cortical selector genes Pax6[3, 60] and Lhx2, both of which are also required for the differentiation of subsets of glutamatergic neuronal lineages in the OB. Consistent with a potential compensatory role for Pax6 in the OB, in the embryonic neocortex, we previously demonstrated that Neurog1/2 are required for the first wave of neurogenesis (<E14.5), whereas Pax6 drives the second wave (>E14.5) . At first glance, the presence of OB defects in Neurog1 −/− and not Neurog2 −/− single mutants might suggest that these two transcription factors have distinct functions. However, we show here that Neurog1 is upregulated in the presumptive OB of Neurog2 −/− single mutants, probably compensating for the loss of Neurog2. We thus suggest that Neurog1 and Neurog2 are for the most part functionally redundant in the developing OB. Consistent with this idea, only in Neurog1/2 −/− double mutants are severe defects in OB development observed. OB and neocortical projection neurons differ, yet both arise from adjacent pools of dorsal telencephalic progenitors. How does neuronal diversification occur? One possibility is that OSN-derived or OEC-derived signals alter the cell-fate specification functions of Neurog1/2. Consistent with this idea, at ~ E11 when mitral cells begin to differentiate, OSN pioneer axons infiltrate the primordial OB [10, 11], as do OECs, which wrap OSN axons [57, 62–65]. How might OSNs/OECs influence the cell-fate specification properties of Neurog1/2 in the OB? OSNs secrete Fgf8 to noncell-autonomously reduce OB progenitor cell proliferation [11–16], while OECs produce an unknown chemoattractant that guides OB neuronal migration . One possibility is that the activation of downstream signaling pathways in the OB triggers a change in the cell-fate specification properties of Neurog1 and Neurog2. For instance, modification by Neurog1/2 by phosphorylation might result in the capacity of these proneural genes to turn on the expression of genes such as Tcfap2e, which is specifically expressed in OB lineages, a possibility that will be investigated in the future. In the region of the dorsal telencephalon that will become the neocortex, Neurog1/2 regulate a binary fate choice between dorsal, glutamatergic versus ventral, GABAergic neuronal fates [18, 19]. Consequently, in Neurog2 KI/KI and Neurog1/2 −/− embryos, neocortical progenitors and their neuronal derivatives are misspecified, acquiring a dorsal LGE-like identity . Notably, the dorsal LGE is the ventral telencephalic progenitor zone from which most OB interneurons arise during embryogenesis, including granule cells and periglomerular cells [13, 35, 43, 44, 67]. Consistent with the expansion of a dorsal LGE-like progenitor pool in Neurog2 KI/KI and Neurog1/2 −/− embryos, several interneuron markers were ectopically expressed in the mutant OBs/OBLSs. OB interneuron differentiation is regulated by multiple transcription factors, including Ascl1 and Dlx1/2, which control distinct differentiation pathways [6, 35, 68]. Here we found that Ascl1 and Dlx1/2 are both upregulated in the Neurog2 KI/KI OB and Neurog1/2 −/− OBLS from E13.5 of development, as previously reported in the neocortex . Additional transcription factors required for the differentiation of subsets of OB interneurons were also ectopically expressed in the Neurog2 KI/KI OB and Neurog1/2 −/− OBLS, including Sp8, Pax6[44, 69] and Er81. By monitoring interneuron marker expression in GFP-labeled OB cells derived from the Neurog2 lineage, we were able to show that the ectopic Sp8-expressing, Pax6-expressing and Er81-expressing interneurons in Neurog2 KI/KI and Neurog1/2 −/− OBs were derived from pallial progenitors that had undergone a fate switch, as opposed to an increase in the migration of OB interneurons. Neurog1/2 thus play a similar role in regulating a binary fate switch between an excitatory glutamatergic neuronal phenotype versus inhibitory interneuron phenotype in both the OB (present study) and neocortex [18, 19]. We show here that Neurog1/2 −/− embryos have severe defects in OB morphogenesis, forming an aberrantly localized OBLS in the ventrolateral brain. Interestingly, similar OB morphological defects are also observed in Pax6 mutants [3, 60] and Lhx2 mutants , cortical selector genes that are required to specify dorsal telencephalic regional identities [72, 73]. In contrast, the morphogenetic defects observed in the Neurog1 −/− OB are more modest, with a reduction in OB size and aberrant lamination of the GL and MCL. Given that the driving force for OB morphogenesis is thought to be a reduction in proliferation in the presumptive OB at the rostral tip of the telencephalon, which is left behind as surrounding neocortical territories expand [11, 12], we examined proliferation in Neurog1/2 mutant embryos. We found that proliferation rates do not decline in the presumptive OB versus neocortex in either Neurog1 −/− or Neurog1/2 −/− embryos, probably accounting at least in part for the inability of the OB to protrude outwards. Nevertheless, differences in proliferation alone cannot explain why the OBLS morphogenesis defects in Neurog1/2 −/− embryos are so much more striking than those observed in Neurog1 −/− OBs. We speculate that the added OB neuronal specification defects observed in Neurog1/2 −/− embryos (present study), Pax6 −/− embryos [3, 60] and Lhx2 −/− embryos , which are not observed in the Neurog1 −/− OB, may alter neuronal migratory routes, hence influencing the aberrant positioning of the OBLS. 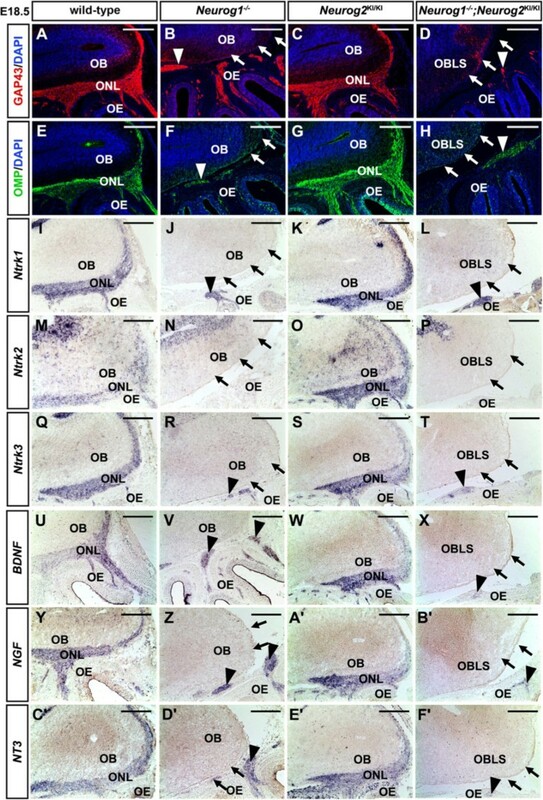 Several studies have suggested that the normal reduction in proliferation of presumptive OB versus neocortical progenitors is induced by the innervation of the OB by OSN axons . The first pioneer OSN axons innervate the OB at E11, when OB morphogenesis first begins, but it is not until E13 to E15 that a sizeable number of OSN axons enter the OB, first innervating the ONL and later infiltrating the GL, where they make synaptic contacts with mitral cell dendrites [11, 64, 74–76]. Consistent with these studies, we found that Neurog1 −/− and Neurog1/2 −/− OSN axons do not innervate the OB, instead terminating prematurely in a FCM. The FCM formation and lack of OB innervation in Neurog1−/− embryos is also strikingly similar to the phenotypes observed in Arx Fezf1 and Dlx5 mutants, which also develop a smaller OB with aberrant MCL and GL lamination [13–16]. However, Dlx5 Arx and Fezf1 are not expressed in pallial lineages – but rather in subpallial and/or OSN lineages, where they control the differentiation and/or migration of OB interneurons through cell autonomous and nonautonomous mechanisms [13–16]. Strikingly, the abnormal formation of the MCL and GL in Neurog1−/− OBs more closely resembles phenotypes observed following the mutation of genes that are expressed in OSN lineages and prevent innervations of the OB, including Fezf1 Dlx5 and Klf7[16, 77, 78]. Why do Neurog1 −/− OSNs fail to innervate the OB? The basal lamina surrounding the brain is remodeled at E14.5 to allow OSN axon penetration, an event that depends on canonical Wnt signaling  and matrix metalloproteinases. In Dlx5 mutants, the defects in OSN penetration of the OB may be related either to defective differentiation of OSNs, which similar to Neurog1 −/− OSNs also express markers of differentiated neurons, or in the frontronasal mesenchyme, which also expresses Dlx5. In Fezf1 mutants, the removal of this basal lamina has been shown to rescue the OSN phenotype, resulting in OSN penetration of the OB. Other possibilities include the loss of a chemoattractant activity in the Neurog1 −/− OB itself. While we did not identify any defects in the expression of the neurotrophin receptors or ligands in the OB or OE of Neurog1/2 −/− Neurog1 has been shown to regulate the OB expression of prokineticin 2 (PK2) , a secreted proteins that binds G-protein coupled receptors. Notably, PK2-deficient mice phenocopy the Neurog1 −/− OB defects, at least in part because PK2 functions as a chemoattractant for OB interneurons born in the ventral telencephalon . Future work will be required to determine whether PK2 also functions as a chemoattractant for OSN axons, and to determine whether Neurog1 function is required in the OB and/or OE for OSN innervation of the OB. Previous analyses of the Neurog1 −/− OE revealed that fewer OSNs express a subset of mature neuronal markers at early developmental stages (E12.5), including the pan-neuronal marker SCG10, suggestive of a block in differentiation . However, these defects are only partial, as other OSN markers, such as Ebf1 and Lhx2, are expressed at normal levels in E12.5 Neurog1 −/− OSNs. Here we examined the differentiation of Neurog1 −/− and Neurog1/2−/− OSNs at a later developmental stage (E18.5), revealing only a minor reduction in the expression of mature OSN markers, including SCG10, GAP43, OMP and the OR genes L45 M72 and P2. The expression of mature OSN markers in the Neurog1 −/− OE may be due in part to the maintained expression of Lhx2, which is required to initiate OE differentiation , or Six1, which functions upstream of Neurog1 to regulate OSN differentiation . In addition to the ability of the OE to influence OB development, it has conversely been suggested that the OB can influence the OE. Indeed, bulbectomy results in a loss of OSN marker expression and increased apoptosis in the OE . In this regard it is interesting that in Neurog1/2 −/− OE there is an increase in apoptosis that is not observed in the Neurog1 −/− OE. At first glance, this is surprising, as Neurog2 is only expressed in a small dorsomedial domain of the OE (present study), whereas Neurog1 expression is widespread . While Neurog2 cannot rescue the OSN innervation defects observed in Neurog1 −/− embryos, we cannot rule out the possibility that Neurog2 initiates the expression of survival signals in the OSN, thereby compensating for the loss of Neurog1 in the OE. However, given the limited expression domain of Neurog2, we do not believe that this is the case. Instead we suggest that the Neurog1/2 −/− OBLS is deficient in a trophic signal that is an essential survival signal for OSNs in the OE. While we investigated whether the neurotrophins might be contributing to the death of the OSNs, no defects in Ntrk receptor or ligand expression in the OE was observed in the Neurog1/2 mutants, suggesting that other factors must be involved. In this article we find that both Neurog1 and Neurog2 are expressed in OB progenitors, where they function redundantly to specify the identities of glutamatergic OB neurons, including mitral and juxtaglomerular cells. Conversely we show that Neurog1 is required to promote OSN innervation of the OB, and consequently influences OB proliferation and morphogenesis. We thus conclude that the proneural genes Neurog1 and Neurog2 coordinately regulate development of the olfactory system by regulating proliferation, cell fate specification, neuronal migration and axonal innervation. The generation of Neurog1 and a Neurog2 GFP KI null allele was previously described [24, 29]. Double heterozygous mice carrying null alleles of Neurog1 and Neurog2 KI were maintained on a CD1 background and males and females were crossed to generate embryos. Mating was confirmed via vaginal plugs, with mouse embryos being staged by considering the plug date as E0.5. Embryos were genotyped as previously described [19, 24]. All animal procedures were approved by the University of Calgary Animal Care Committee (Protocol # AC11-0053) in agreement with the Guidelines of the Canadian Council of Animal Care (CCAC). Embryonic dissections were performed in PBS. Tissue was fixed at 4°C in 4% paraformaldehyde/1× PBS overnight, rinsed in 1× PBS and then cryoprotected in 20% sucrose/1× PBS at 4°C before embedding in Tissue-Tek optimum cutting temperature (O.C.T.) compound (VWR Canada, Mississauga, ON, Canada). Tissue sections (10 μm) were collected on Superfrost Plus (Fisher Scientific, Ottawa, ON, Canada) slides using a CM3050-S cryostat (Leica Microsystems, Richmond Hill, ON, Canada). RNA in situ hybridization was performed as previously described . The following riboprobes were used: Ascl1, BDNF (IMAGE:1397218), Dlx1, Emx1, Fgfr1, Gad1, Lhx2, NeuroD1, NeuroD6, Neurog1 (IMAGE:30146192), Neurog2, NGF (IMAGE: 4190781), NT3 (IMAGE: 1177923), Ntrk1 (IMAGE: 421391), Ntrk2 (IMAGE:5707891), Ntrk3 (IMAGE: 40110345), SCG10, Tcfap2e (IMAGE:778986) and L45 M72 and P2 odorant receptors (gifts from J-F Cloutier). Tissue sections were blocked in 10% horse serum/1× TBST (50 mM Tris–HCl, 150 mM NaCl, pH 7.4, 0.05% Triton X-100) for 1 hour at 37°C. For BrdU immunolabeling, the sections were first denatured in 2 N HCl for 30 minutes at 37°C prior to applying the blocking solution. Sections were incubated with primary antibodies diluted in 1× TBST overnight at 4°C. Sections were washed three times in 1× TBST for 10 minutes, then incubated with secondary antibodies diluted in 1× TBST for 1 hour at room temperature, before washing the sections again three times with 1× TBST for 10 minutes. Next, DAPI (Polysciences Inc., Warrington PA, USA) diluted in 1× TBST (1/10,000) was applied for 5 minutes. Finally, the sections were washed three times in 1× TBST, mounted with Aqua Polymount (Polysciences). The following primary antibodies were used: rabbit anti-activated caspase 3 (1/500; Promega, Madison, WI, USA), rat anti-Brdu (1/500; Roche, Mississauga, ON, Canada), rabbit anti-calretinin (1/2,000; Swant, Bellinzona, Switzerland), rabbit anti-Er81 (1/300; Developmental Studies Hybridoma Bank, Iowa City, IA, USA), rabbit anti-GAP43 (1/750; Millipore Canada, Etobicoke, ON, Canada), rabbit anti-GFP (1/500; Invitrogen (Burlington, ON, Canada), mouse anti-GFP (1/500; Millipore), rat anti-L1 (1/500; Millipore), goat anti-Neurog1 (1/100; Santa Cruz Biotechnology Inc., Santa Cruz, CA, USA), mouse anti-Neurog2 (1/3; Dr David Anderson ), goat anti-OMP (1/5,000; Wako Chemicals USA, Richmond, VA, USA), rabbit anti-Pax6 (1/500; Berkeley Antibody Company (BAbCO, Richmond, CA, USA), rat anti-PSA-NCAM (1/500; Millipore,), rabbit anti-S100b (1/500; Dako Canada Inc., Burlington, ON, Canada), rabbit anti-Slc7a6 (1/600; Synaptic Systems GmbH, Goettingen, Germany), rabbit anti-Slc17a7 (1/750; Synaptic Systems), goat anti-Sp8 (1/1,000; Santa Cruz), rabbit anti-TH (1/500; Santa Cruz), rabbit anti-Tbr1 (1/600; AbCam (Cambridge, MA, USA), rabbit anti-Tbr2 (1/800; AbCam), rabbit anti-vGlut1 (1/500; Synaptic Systems) and rabbit anti-vGlut2 (1/500; Synaptic Systems). Whole E18.5 heads were placed in Bouin’s fixative and processed for paraffin sectioning as previously described . Sections were deparaffinized in three xylene washes for 3 minutes each, followed by rehydration in a decreasing ethanol series (2× 100%, 2× 95% and 2× 80%) for 3 minutes each. Slides were then immersed in water for 5 minutes, before staining in hematoxylin for 3 minutes. The slides were then rinsed in water for 2 minutes, and stained in eosin for 30 seconds. Slides were then dehydrated in 3-minute ethanol washes in an ascending series (2× 80%, 2× 95% and 2× 100%). Finally, the tissues were incubated in xylene overnight, and mounted in Permount SP15-100 Toluene Solution (Fisher Scientific). Composite photomicrographs of the entire OB were used to count immunoreactive cells from a minimum of three embryos and three sections per embryo. Graphs and statistical tests were generated with GraphPad Prism Software version 5.0 (GraphPad Software Inc., La Jolla, CA, USA). Error bars represent the standard error of the mean. Statistical significance was determined using one-way analysis of variance and a post-hoc Tukey’s test. The authors thank F Guillemot, D Anderson, J-F Cloutier and K Campbell for providing reagents, and Nicole Gruenig and Natasha Klenin for technical support. This work was supported by a CIHR (MOP-44094) Operating Grant to CS. CS is an Alberta Innovates Health Solutions (formally AHFMR) Senior Scholar. Experiments were conceived and designed by TS and CS, and most were performed by TS with assistance from DD in cell counts. DMK contributed reagents, technical and intellectual assistance. The manuscript was written by TS and CS and edited by all authors. All authors read and approved the final manuscript.